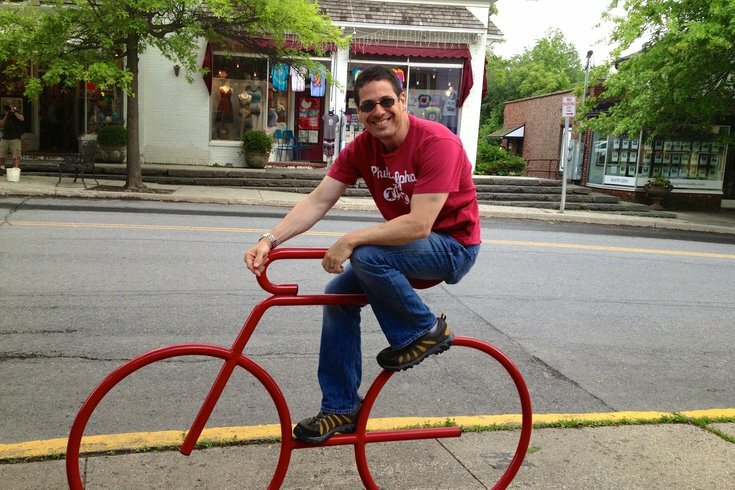 Josh Piven, a Center City-raised author, playwright and self-described humorist. Raised in Center City, author and humorist Josh Piven — best known for his 1999 book "The Worst-Case Scenario Survival Handbook" — spent the bulk of his writing career in New York and Los Angeles before "coming to his senses," he says, and realizing that Philly was home. Now back in his old stomping grounds, Piven is set to debut his new play "Muddled" at Drexel University's URBN Center on June 16. The story follows Andy, a hipster, who's fired from Facebook after drunk-twerking at Mark Zuckerberg's wedding. He rebounds by opening a ’20s-style lounge in Brooklyn, before his ’80s-rockstar dad shows up and convinces him to transform the stodgy supper club into a breeding ground for hipsters and headbangers. Below, Piven explains what Philly bar inspired the play, just what defines a hipster and what he thinks life's all about. What inspired the new play? A few things. The setting and the loose theme of the futility of trying to reject the internet were inspired by the wonderfully odd bar Hop Sing Laundromat in Chinatown. I went a few years back and was struck by the comical possibilities of a bar that does not allow cellphone usage. They eventually relaxed the rule, but at that time, you could basically be kicked out if the bouncer caught you on a cellphone. (Full disclosure: I'm a bit of an amateur mixologist, so the craft cocktail thing had appeal also.) I also was interested in writing a comedy about the '80s, which is when I grew up and was, of course, the 'simpler' time of no internet. So, I decided to combine these two themes, sort of the hipster generation meets the headbanger generation. So, all of that, plus I'm partial to '80s rock, so I had to work that in. What do you think is the most annoying type of post on Facebook? Who do you think qualifies as a hipster? What characteristics and look do you need? Well, there are no hard and fast definitions. But there are telltale signs. Bikes. Ironic T-shirts. ’80s clothing (especially sunglasses). Beards. Watch caps. Doing the gig economy thing. Having a cardboard 'Feel the Bern' sign attached to your bike/backpack. Reusable water bottles (though I have like three of those, too). Tattoos in pretty much every place. Hugely pierced earlobes. Being a chef. Spending so much time at Starbucks they think you're part of the decor. Kombucha. 'Have a good time. All the time.' Yes, that's a quote from Viv Savage of 'Spinal Tap.' Now you see why I wrote the play? The Bible. But I was just the editor.